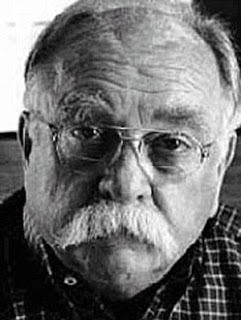 I don’t remember precisely when it started happening, but sometime in the early 1990’s people began saying my father looked like Wilford Brimley. It happened so much, I started getting annoyed, especially since I could never see the resemblance. But then one spring day, my husband and I were stuck in the Seattle airport when our flight was cancelled due to mechanical problems. I was wandering aimlessly waiting for another flight when I saw my dad walk by. Giles looked at me with a bemused expression. “That guy was Wilford Brimley,” he said. Since I had nothing else to do, I decided to prove my husband wrong, and turned to follow the man. It turned out, he was Wilford Brimley, and he was seated in a gate for Alaska Airlines. I walked by him about ten times before he noticed his stalker. At that point, I decided to do the only thing I could. No, I didn’t introduce myself as his doppelgänger’s daughter. I called my dad from a nearby pay phone to tell him that I was looking right at Wilford Brimley and that he indeed, looked like my father. Dad was unimpressed, but I wasn’t. To this day, that moment always makes me smile. Posted on November 10, 2013, in Family, My life, perspective and tagged 365 reasons to smile, Family, fathers, life, musings, parents, perspective, smiles, wilford brimley. Bookmark the permalink. 64 Comments. just so you know; ways we are alike: we are both fat, we were both born in 1934, we are both actors (I’m better), we both have something white under our noses …ways we aren’t alike: Wilford made a lot more money acting than I did and I have HAIR on top of my head! !